This weekend I attended beCamp, “Charlottesville’s version of the BarCamp unconference phenomenon”. Basically a tech meetup with talks, talking outside of talks, food, and drinks. All around, a good time. This was my first beCamp, but I enjoyed it, and will probably try to go to others in the future. The way the camp goes, you show up Friday night and people stand up and say things they could talk about, if there’s interest. And then people put marks about if they’d attend or whatever, and a schedule of talks for Saturday comes together. When I signed up for the camp a week beforehand, my intention was to spend some free time during the week preparing a talk about R. Didn’t happen, but I stood up Friday and said I could maybe say a few words about it anyway. I got a few ‘Learn’ checkmarks, indicating a little interest. Lucky for all involved, though, I didn’t get officially scheduled to talk. Of course, I didn’t know that until I showed up Saturday, having spent about 2 hours that morning trying to throw something together, just in case. I can’t say I was too disappointed with not having to talk, though it could have been fun. At lunch, there was about an hour of “lightning talks”, just 5 minute talks. While I was sitting there, I figured that would actually be a good amount for me. Just as the line of talkers for that was starting to wind down, and I was thinking about joining it, a handful more queued up. Those talks used all the remaining time, so I was, again, off the hook. But, hey, I’ve got this venue, I can talk about stuff whenever I want, right? So here’s some notes about R I was just about prepared to mumble about Saturday. According to the webpage, “R is a free software environment for statistical computing and graphics.” It’s something like an open source clone of the S software for stats processing. The language has some sort of interesting aspects to it, and also some things that really get me sometimes. R has some good built-in “call for help” utilities, making it sort of easy to pick up and do fairly interesting things fairly quickly. Perhaps one of the best things is the huge collection of freely available libraries. I’ll try to talk about some or all of these things, showing by example and not being too formal (me, informal? ), but hopefully still fairly close to correct (or, at least, usably incorrect). Folks wishing for more can certainly jump to the official introduction. John D. Cook has some good notes about picking up R if you know some programming (I’m assuming you do), and I also found “The R Inferno” [pdf] informative. Those lines with the arrow in front are the input lines, where you type, and the other lines are the output. Anyway, pretty exciting, no? I should mention that you can reproduce this, or other examples, by running R from the command line, or using R-specific editors (or emacs add-ons). I’ve been using RStudio recently, and, while it’s got its issues, it’s got some nice features too. Worth a check-out. Here’s an example of writing our own function. Pretty straightforward… note that ‘<-‘ is the assignment operator (‘=’ would also work here, but I think ‘<-‘ is more R-ey). There’s another assignment operator, ‘<<-‘, which, I think, is a little bit of a bad habit to use. It’s along the lines of making the thing on the left a global variable, but I’d rather not get too much into that sort of thing (i.e., things I don’t understand at all, instead of things I can at least pretend a little about). I seem to recall reading somewhere the R using lexical scoping rules. If you know what that means, good for you. I think it applies here, because if we didn’t assign to fact, then the call to fact at the end of the function would fail. Oh, and note you can return things in R with return(), but more typically results get returned by just having them be the last line of the function (in my (limited) experience). Ok, only so informative, since it passes work off with that .Internal call, but the principle is there. "3 feet is 1 yards"
 "24 feet is 8 yards"
 "15 feet is 5 yards"
(that example is based on something I read in a blog post, but I can’t find the link… it was talking about the things I said in the last paragraph, and did an example of converting polar to cartesian coordinates, if memory serves…) (Update 20111004 – found it). Anyway, I said R was for stats… we should do some of that. Fitting lines to data sounds like a statsy thing to do, and R is for stats, so let’s do that. Let’s take the nums we made above and use them as offsets from the line y=5x. Then we’ll fit a line to that data, and it’s slope should be pretty close to 5. Note that ‘.’ isn’t special in R like it is in many other languages, so it’s typically used to separate words in variable names (although, it can be used in formulas, see later). Sort of the equivalent to other languages’ ‘.’ is ‘$’, exemplified below. Looks fine to me. Of course, it’d probably be cool to try something with actual data. If you’ve got a csv sitting around, R is quite good at reading them in. If you don’t have a csv sitting around, I found some census data, and it seems R will open csvs across the wire (which is kinda hot). So… what’d we just get? Well, we could read about it, or just mess with it. We’ve already seen summary(), so we can try that. Below, I’ve only shown the top of the output. Each of these headers is a name we can use to index into the census object. It’s technically a “data frame”, one of the types in R. That means it’s basically a (not-necessarily-numeric) matrix (as you might expect from a csv table), each column has the same number of entries, and within a column, all of the entries are the same type (no mixing strings with numbers). The names are the column names, and you can use the ‘$’ operator to get at any particular column. > which(substr(states, 1, 1) == "P") # substr is, apparently, "vectorized"
Like I said, census is basically a table. You can pull out rectangular bits of it easily, as the example below shows. And it’s easy enough to generalize that a little, and start pulling out whatever bits you want. If you leave one of the coordinates in the ‘’ empty, it means “everything”. So census[,] is the same as census (for some definition of “same as”). Right, we’re supposed to be doing statsy things. We should be actually playing with the data… Let’s pick out some easy bit. Let’s play with the “POPESTIMATE2009”, “BIRTHS2009”, and “DEATHS2009” values for just the states. "6"  "7"  "8"  "9"  "10" "11" "12" "13" "15" "16" "17" "18" "19" "20" "21"
 "22" "23" "24" "25" "26" "27" "28" "29" "30" "31" "32" "33" "34" "35" "36"
 "37" "38" "39" "40" "41" "42" "43" "44" "45" "46" "47" "48" "49" "50" "51"
 "52" "53" "54" "55" "56"
We fit a line to data earlier, and can expand on that here. 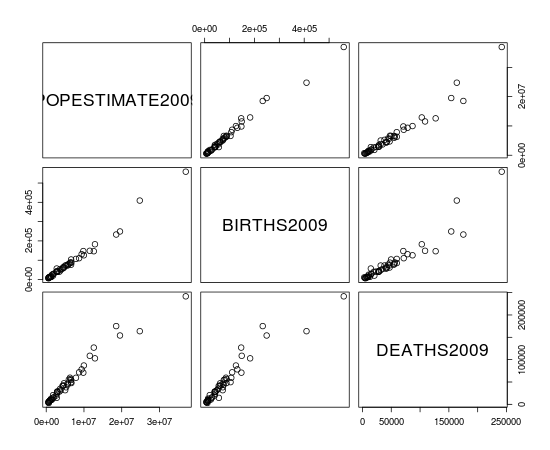 Let’s model the population estimate given the births and deaths. I’m not trying to display some dazzling insight into the data, just show how easy it is in R to do this sort of thing. That looks good and statsy. If you don’t have your own data, by the way, R comes with some, and many libraries bring in their own, for examples. Just poking around a little (here’s to tab completion), I found, for example, that R comes with a data frame with state-by-state arrest counts by crime (USArrests</code). I mentioned earlier that '?' is good for getting help on a command. If you want to find a command to use, use '??'. This frequently returns lists of packages that you can poke at. One of the great things about R is that many of the libraries you can install come with 'vignettes', providing a little tutorial on some of the tools in the package. R makes it very easy to install packages (install.packages()). I’m sort of running out of steam for the evening, so think I may wrap this up. I had sort of envisioned talking about a couple of fun packages. Guess I’ll save that for another post (this has gotten long anyway), and try to do some cool examples, with prettier pictures. Right, so I started reading, and got to the first set of exercises. I know I’ve done the second and third before. The second (show there are arbitrarily large gaps between primes) I actually remember doing from my freshman year as an undergraduate, so didn’t put much into it. The third (show and that this implies ) I remembered doing while I was reading Hardy & Wright more recently, and decided to see if I could get the inequalities right again. It took a few minutes, but I think I got there. Ok, so the first part of that question I got without much difficulty (actually, I got wrong without much difficulty). It’s just all the other primes bigger than 5 but less than 30: 7, 11, 13, 17, 19, 23, 29 (see my error yet?). The second part got me though (since I got the first part wrong). There’s only 7 numbers in that list I just picked out, so what more is there to show? Any 30n+r that’s prime must have an r from that list, because everybody else is divisible by 2, 3, or 5, right? Nope. Stupid 1. The case r=1 isn’t accounted for. So that means that primes could actually show up in any of 8 spots. So that’s where the hint about multiples of 7 comes in. The first multiple of 7 in the 30 consecutive integers comprising E corresponds to r = 0, 1, …, 6, and then for any of those choices, you can easily write down what the other multiples of 7 are. 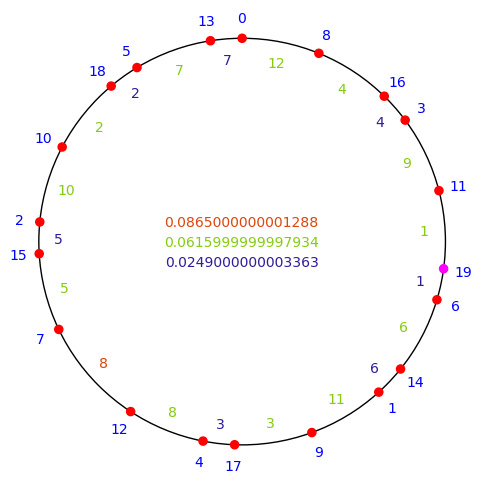 For example, if the first multiple of 7 in E is with r = 3, then the other multiples are at 10, 17, and 24. Notice that, in this case, the prime 17 would have to get taken out of the 8 possible spots for primes (since it is now known to be a multiple of 7), and we’d be down to 7 primes. The same thing happens in the other 6 cases about the multiples of 7, and we obtain the result. So that slightly rocky start, those 5 pages of reading and 3 exercises, took just under a week, start to finish (not that I was actively working on it that every day). And, in all honestly, I only sorted out that first one when I sat down to start writing, here, that I couldn’t figure it out. But whatever. There’s my first post since graduation. Perhaps I’ll keep learning some math after all (in addition to the math/stats sorts of things I’m learning for work). Here’s to fewer errors in section 2! So according to the title, I should be telling you about , as a functor of manifolds and . That’s perhaps a bit ambitious. I’ll only be thinking about , a disjoint union of closed disks, and I’ll actually fix . And instead of letting range over any manifolds, it’ll just be , ranging over real vector spaces. By taking derivatives at centers, we obtain a homotopy equivalence from to something I’ll maybe denote . This is componentwise affine (linear followed by translation) maps whose restriction to -balls around the 0s is an embedding. I may use , and write . And I’ll actually send everything to spectra, instead of topological spaces, via . as a functor of . I’ll be lazy and write it , having fixed an and to give . The first useful case is when (i.e., ). Then embeddings are just configuration spaces, . I’ve talked before about a homotopy limit model in this case, but let me remind you about it. The category I have in mind is something I’ll denote . Objects will be non-trivial partitions of , and I’ll probably denote them , perhaps writing . Non-trivial means that some equivalence class is larger than a singleton. I’ll write if is finer than , meaning that whenever , then . The functor I want is something I’ll denote and call “non-locally constant” maps. So is the set (space) of maps such that there is an where . Equivalently, maps which don’t factor through . The second useful case is when (i.e., ). Then the space of embeddings is homotopy equivalent to the space of injective linear maps. You can obtain a homotopy limit model in this case that looks strikingly similar to the previous case. Namely, you set up a category of “linear” partitions (equivalent to modding out by a linear subspace), and take the holim of the non-locally constant maps functor, as before. I like to think of both cases as being holims over categories of kernels, and the non-locally constant maps of some kernel are maps that are known to fail to be not-injective for some particular reason. Embeddings fail to be not-injective for every reason. But there’s another model I want to use in what follows. My category will be denoted , and objects in the category will be vector spaces with non-zero linear maps . Morphisms from to will be surjective linear maps with . You might think of the objects as an abstract partition ( ) with a map to , which then determines a partition of , by taking the image. Here denotes the join. For categories, is , obtained by adding a new initial object to each of and , taking the product, and removing the initial object of the result. Both of which are homotopy pullbacks. The equivalence of the lower-right corners follows because join is similar enough to smash, which plays nicely with . Objects in the category consist of a partition along with, for , linear . To tidy up a little bit, I’ll denote this category , for join. The functor takes an object as above and returns the set of componentwise affine maps such that either (a) the map is non-constant on some component, (b) when restricted to the image of , the map is non-locally constant with respect to . There you have it, a homotopy limit description for the embedding functor. But not a particularly nice one. If we had an embedding , then we’d have map . It’d be really swell if this map was modelled by a map of the categories we are taking homotopy limits over. But that’s not going to happen. What can go wrong? Non-trivial partitions of , when sensibly composed with the map to , may become trivial, and thus not part of the category. This is, essentially, because several components of might map to a single component of . If has two components, and one, say, where do you send the object consisting of the non-trivial paired with some 0 vector spaces? An affine space is, loosely, a vector space that forgot where its 0 was. There is, up to isomorphism, one of any given dimension, just like for vector spaces; I’ll denote the one of dimension by , say. That should be enough of a description for now. Let me define a Complete Affine Partition (CAP), , to be a partition of a disjoint union of affine spaces, such that equivalence classes contain components. That is, everybody that’s in the same component is in the same equivalence class. Given a , I’ll denote by the underlying component-wise affine space. The data that determines a is: a finite set (the set of components), a partition of , and a dimension function, (non-negative integers). With this information, is . By a refinement from to , denoted , I will mean an affine map so that the “affine closure” of the partition is coarser than . I don’t want to spend too much time talking about the affine closure operation, on partitions of a component-wise affine space. If and have a single component, a refinement is just a surjective affine map (recall before we had surjective linear maps in ). If and have dimension function 0, so basically and (partition of possibly distinct finite sets), a refinement just means . We’re now ready to define a category, which I’ll denote . The objects will be pairs of: a CAP, , along with a non-locally constant affine (subsequently denoted ). A morphism from to will be a refinement such that . This should look familiar to the construction. since , and we know the homotopy limit over has the right homotopy type. This is our goal. I’ll use the semi-direct product notation for the Grothendieck construction, as follows. Recall that for a category , and a functor , the Grothendieck construction is a category, which I’ll denote , whose objects are pairs where . Morphisms to are morphisms such that . Of course, my functors are all contravariant as defined, so you have to mess about getting your arrows right. Best done in private. I claim that can be written as a Grothendieck construction. Actually, it can in a few ways. The obvious way is to set to be the category of CAPs , paired with refinements. The functor you need is then . You find that . But there’s another way to slice it. Let be the category of CAPs , along with functions . Now the functor you need is not all non-locally constant maps to , but only those that are lifts of . You might denote this set . I’m tired of all the notation, so let me let denote this non-locally constant lifts functor. We have, then . While I’m simplifying notation, let me also write for . Notice that it is actually a functor from , and thus from . Let’s return to the category again. It has the same structure. In fact, we just need to pick out of the subcategory of CAPs whose set of components is , and where is the identity on . Calling this subcategory , we have . We’ve got . Between them lies a category I’ll denote , consisting of arrows with , . Morphisms are “twisted” commuting squares, as they should be, as part of the twisted arrow category. One can reduce the holim over to one over , and from there to one over . To reduce from to , one can show that for all , the over-category is contractible. In fact, this result seems to rely very little on our particular and , and doesn’t depend on the functors, , , or . Essentially this shows that , as a functor from , is equivalent to the right Kan extension of it’s restriction to a functor from . And the homotopy limit of a right Kan extension is equivalent to the homotopy limit of the restricted functor. It is in this second reduction, to , that we rely on information about our categories and functors ( , in particular). Pick your object . You can quickly reduce the crazy over-category above to just . Now remember is a CAP with a function to . I’ll denote it . If this function is locally constant (all objects within an equivalence class get sent to the same point), then you sort of replace with an object obtained by taking affine and direct sums of it’s components. The result is an object of , but from the perspective of , the two objects give equivalent spaces of lifts. Alternatively, if is non-locally constant, then every lift is non-locally constant, and so . This all works out to be useful in the whole proof. But I’ll maybe save all that for another day. The branch of mathematics known as topology is concerned with the study of shapes. Whereas shapes in geometry are fairly rigid objects, shapes in topology are much more flexible; topologists refer to them as “spaces.” If one space can be flexed and twisted and not-too-drastically mangled into another space, topology deems them to be the same. It becomes much more difficult, then, to tell if two spaces are different. A primary goal in topology is to find ways to distinguish spaces. It turns out that these two primary questions of topology are actually related. If one wants to determine how similar shapes and are, one might begin by introducing a third space, , and asking about the maps from to and from to . If the collection of maps are the same in both cases, one expects that and are similar, at least somewhat. More information can be obtained by replacing by another space , and repeating the process. Typically the spaces and are fairly well-understood spaces, like circles and spheres. Spaces, and the maps between them, can be quite complicated in general. By restricting to various types of spaces, or types of maps, one is able to make significant progress. One important class of spaces consists of what are called “manifolds.” Intuitively, a manifold is a space which, when viewed from quite close, looks flat (like a line, or a plane), and has no corners. If you were a tiny ant, walking along on a mathematician’s idealized sphere, for example, you might get the impression that you were walking on a giant sheet of paper. Indeed, a similar viewpoint of our own world was common in the not too distant past. Circles and spheres, and lines and planes themselves, make good examples of manifolds to keep in mind. In fact, lines and planes, and the higher dimensional “Euclidean” spaces, are the fundamental building blocks for manifolds. The defining property of a manifold is that when you get close enough, you are looking at a Euclidean space. Manifolds are essentially spaces obtained by gluing together Euclidean spaces. An interesting example, known as the Möbius strip, can be modeled by taking a strip of paper, introducing a half-twist, and taping the ends together. A tiny ant crawling along on the resulting object would have a hard time noticing that it isn’t just crawling along a strip of paper. If one’s attention is restricted to studying manifolds, instead of more general spaces, it makes sense to also restrict the types of maps under consideration. General continuous maps need not respect the information about manifolds that makes manifolds a nice class of spaces (they are reasonably “smooth”). We replace, then, all continuous maps with a more restricted class of maps which preserve the structure of manifolds. A particularly nice such class consists of those maps known as “embeddings.” An embedding will not introduce corners in manifolds, and also will not send two points to the same point (embeddings would place only one student at each table, in the earlier example). When studying manifolds, then, a topologist may be concerned with the collection of embeddings between two manifolds. If the manifolds are called and , then we might denote the embeddings of into by . This is then a function itself – a function of two variables, and . 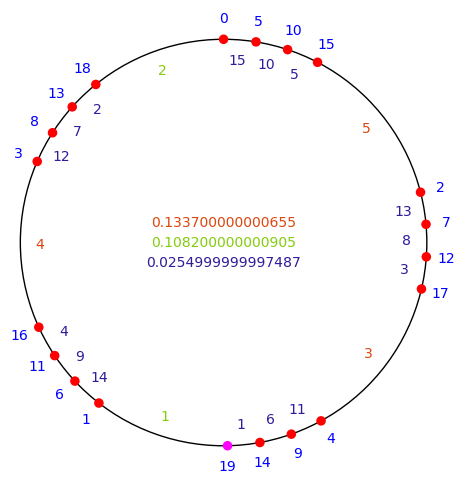 If we fix one of the variables, say we only think about being a circle, we still have a function of one variable, and have made our study somewhat easier. Leaving fixed, how do the values change as changes? Said another way, if we modify slightly, what is the effect on ? If it is difficult to find , how can it be approximated? How can the function itself be approximated? These questions are strikingly similar to questions asked in calculus. Given a function that takes numbers in and spits numbers out ( , for example) what happens to the output values ( ) if the input value ( ) is changed slightly? If we know about the value at a particular point ( ), what can be said about values nearby ( , say)? The answers to these questions lie with the derivative, and its “higher” analogues (the derivative of the derivative, and so on). If one knows about the derivatives of a function at a point, one can create “polynomial” approximations to the function, near that point. It turns out that something quite similar happens when studying the embedding function (and other functions like it). Some sense can be made of derivatives, polynomials, and best approximations, all in the context of functions of spaces (instead of functions of numbers). I have been studying the embedding function, and its polynomial approximations, when is fixed. I let be a collection of disjoint Euclidean spaces of any dimension; so I might take to be 3 lines and 2 planes, all separate from each other. I also restrict my attention to only when itself is a Euclidean space. Since any manifold is built out of Euclidean spaces, the cases I consider are important building blocks to understanding more general embedding functions. Previous work has already covered some of the cases I consider. If is a finite collection of points, the collection of embeddings is called a “configuration space.” Loosely, this case covers the idea that embedding may not bring two points together, and is somewhat of a “global” situation. Another case is when only has one piece, say a single line. Here, one is exploring more the notion that embeddings may not introduce corners, a “local” situation. In both of these cases, the best polynomial approximations for the embedding functions have been identified. Moreover, useful descriptions of the approximations have been obtained. In the more general situation I consider, I have been interacting with both aspects of embeddings. Since my spaces, , may have many pieces, I am involved in global aspects of embeddings. Since my may have pieces of any dimension, I am involved in local aspects of embeddings. Unifying the description of the approximations in these two cases has been my task. A somewhat different, perhaps more elementary version of this is also available. Before getting to this month’s links, allow me a diversion to talk about some geometry I learned a little of this month. There are 6!=720 ways to order the letters A, B, E, I, L, and S. If we declare that two orderings are the same if one is obtained from the other by cyclic permutation (for example, ABEILS and ILSABE are the same), there are 6!/6=5!=120 combinations. If we also declare that a word and it’s reverse are the same (ABEILS = SLIEBA), we have arrived at 6!/(6*2)=60 combinations. 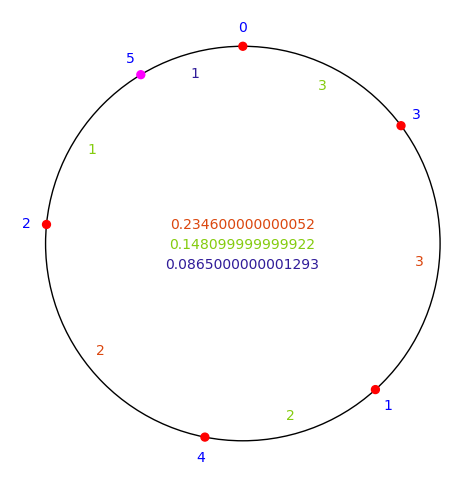 Pick any 6 distinct points on a circle (or any conic section). Choose any of the points as a starting point, and draw a line to any of the other points. Then draw a line to one of the remaining 4 points. Continue until all of the points have been hit, and then draw a line back to your starting point. How many different pictures can you make in this process? 60, again, because you could label the points A, B, E, I, L, S, and then pictures correspond to words from the previous calculation. Each picture you draw is a figure with six edges. These six edges can be put into three set of pairs, where two edges are paired if they are “opposite.” In the process of drawing the lines, above, the line opposite the very first line is the fourth line you draw. Similarly, the second and fifth form a pair, and then the third and sixth. Now, if you extend all of the lines, each pair of opposite edges will determine a point of intersection (or infinity… maybe try another setup for your original points :)). So each picture you draw determines 3 points in the plane (or infinity). When he was only 16, Pascal showed that these three points are always colinear. So, given 6 points on a conic, the process outlined above determines 60 lines, called Pascal Lines. Mathworld has more on Pascal Lines, for the inquisitive, so it’s probably about time to direct you over there and get on to this month’s blog posts! 1) At the beginning of the month, Charles Siegel, at Rigorous Trivialities decided to parallel the National Novel Writing Month (NaNoWriMo) by introducing Math Blog Writing Month, MaBloWriMo. After putting it to a vote, he wrote a series on intersection theory. Also taking up MaBloWriMo were Akhil Mathew at Delta Epsilons, Qiaochu Yuan at Annoying Precision, Harrison Brown at Portrait of the Mathematician and, well, yours truly. I found it to be a great experience, and hope next year brings many more authors. If you like your daily math in bite-size fashion, and not just in MaBloWriMo, you might check out probfact on twitter for daily probability facts. 2) At approximately halfway through the month, Wednesday the 18th was determined to be the 150th birthday of the Riemann Hypothesis. Plus Magazine and Math In The News both had articles. 3) Riemann’s zeta function, the lead character in his hypothesis, is connected to primes by Euler’s product formula. If you are interested in the distribution of the primes, Matt Springer at Built on Facts has a post about the function Li(x), as part of his running Sunday Function series. 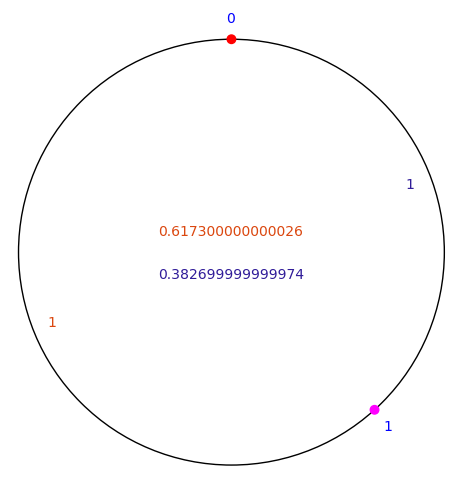 If natural number primes aren’t exciting enough for you, Rich Beveridge at Where The Arts Meet The Sciences has a post for you on Gaussian Primes. JD2718: Puzzle: Who am I? If you prefer unsolved puzzles, Bill the Lizard has recently written posts about the Collatz Conjecture and the Perfect Cuboid Problem. Alternatively, for some behind-the-scenes on the notoriously difficult Putnam exam (and yet more puzzles), head over to Izabella’s post at The Accidental Mathematician. 5) It’ll take a while to get to the 3435th Carnival of Math, so I think I’m not stepping on too many toes if I point you at Mike Croucher’s quick post at Walking Randomly and Dan MacKinnon’s slightly longer post at mathrecreation that talk about what makes 3435 interesting. 6) Brian, at bit-player, finds some interesting math in a collection of staples, as described in The birth of the giant component. 10) Fëanor at JOST A MON presents Accumulated Causes and Unknowable Effects, related to Pascal’s Wager. 12) This month also saw some nice calculus posts. Daniel Colquitt at General Musings describes the fascinating trumpet of Torricelli. Kalid at BetterExplained asked Why Do We Need Limits and Infinitesimals? and had A Friendly Chat About Whether 0.999… = 1. 15) Kareem at The Twofold Gaze points out that asking for a Best Proximate Value has two reasonable answers. 20) Plus Magazine had an article entitled Pandora’s 3D Box, talking about a recently discovered fractal inspired by the Mandelbrot set. 30) Dave Richeson at Division By Zero reports on a case of mistaken identity in Legendre Who? 60) Finally, Samuel at ACME Science discusses the fractured state of the current mathematics community, noting that Mathematics Really is Discrete. This post was closely followed by Abstruse Goose’s Landscape. That’s it for now. Look for the next Carnival, Math Teachers at Play, in two weeks! I apologize for any omissions or errors.